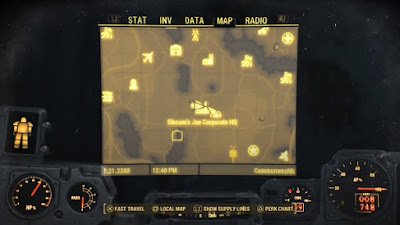 - Slocum’s Joe Corporate HQ is located in Malden, a small community in the east of the Commonwealth. It’s located to the southeast of Sanctuary (more to the east than to the south), and you’re most likely to come across it if you’re sent out to help farmsteads for the Minutemen. - The area around the HQ is quite dangerous, though it may look quiet at first. Malden’s outskirts have issues with Bloodbugs, and when you get close enough to Medford Memorial Hospital, which is a short trip to the west, you’ll hit a rather vicious band of Super Mutants. There are also Synths around the Slocum’s Joe, and they like to get in fights with the Super Mutants. So, you know, don’t be surprised if the area is already embroiled in a fight when you arrive. - Before entering the Slocum's Joe, have a look at the building right next to it. This is Malden's police station. You won't find much of use inside, though if you check the desks on the upper floor you can find Eddie Winter Holotape 2. The terminal beside the Holotape will add the Nahant Sheriff's Department location to your map, if you didn't already have it, as well. - At first glance this building is just a rubbley wreck. There’s a single intact room with a Power Armor Station, and if you go upstairs you can find a few items among the ruined rooms, including a steamer trunk on the third floor with some ammo inside. You won’t find much of use unless you go through the only door on the second floor. - You’ll come out in a ruined office, and there will be Raiders in the next room to your right. You’re in a great place to shoot them through the windows, whether you’re quiet about it or not. The Raiders were trying to open an Advanced safe in the corner, and if you pop it open yourself you’ll find, among other things, the Slocum’s BuzzBites Recipe. The nearby desk contains a Notice to Slocum’s Joe and four Slocum’s BuzzBites, which, if you read the note, may not be the wisest things to eat. - Yep, that’s it. Still, those Synths out front are a little fascinating from a storyline perspective, aren’t they?